SimpleViewer v2.2.0 is fresh out of the oven! We’ve added a bunch of features to the Mobile Gallery plus many UI improvements and bug fixes to svBuilder and svBuilder-Pro. Check the full changelog here. As always, SimpleViewer-Pro upgrades are free within the same major version number, check here for upgrade information. SimpleViewer standard users can get the update here. Please report any issues in the support forum. We’ll be updating the plugins and templates in the next couple of days. It’s that time of year again when the SimpleViewer faeries deposit a fresh new version into our laps! This is mainly a bug-fix release that addresses various issues around embedding and sizing the mobile player. We also added an image rotate button to svBuilder and added a new Pro mobile option ‘MobileShowThumbs’, which allows you disable the thumbnail view for the mobile player. One thing to note is that the SimpleViewer embed code has been modified to make it cleaner and avoid compatibility issues with different versions of jQuery that may be included on the page. The old embed code will continue to work. View the new embed code format here. 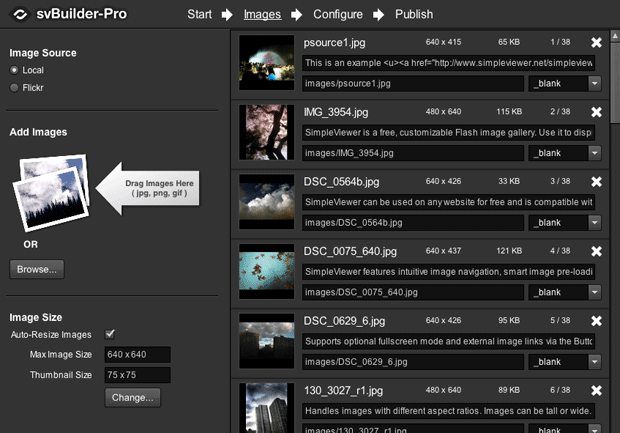 To show how easy it is to instantly load Flickr images into SimpleViewer, we’ve added a new demo. To load your Flickr images, just enter your Flickr user name and/or tags into the page URL. These URLs can be shared to allow others to view your content. Note that your Flickr user name is different than your user id. To get your Flickr user name, login to Flickr and look for the ‘Signed in as…’ text at the top right. You can also get a Flickr username from a Flickr photostream url here (second field down). To get full control over loading Flickr images, upgrade to SimpleViewer-Pro which includes these Pro Flickr configuration options. Please pass on this demo link so others can see how easy it is to use SimpleViewer with Flickr. We’ve updated the WP-SimpleViewer plugin to v2.1.2. The big update is that is version includes SimpleViewer v2.1.2, so it handles Universal Playback. Check out this post on a mobile device to see the SimpleViewer Mobile gallery in action. We’ve also added a bunch of bug-fixes and UI improvements to the plugin. To get the latest version check here. Please leave any feedback or issues in the WP-SimpleViewer forum. We are always working on improving SimpleViewer to give your users the best image gallery viewing experience. This release focusses on improvements to SimpleViewer Mobile. As you probably know by now, SimpleViewer now includes SimpleViewer Mobile, a HTML5 version of SimpleViewer specifically designed for mobile devices that do not support Flash. This includes iPhones, iPads and Android devices. 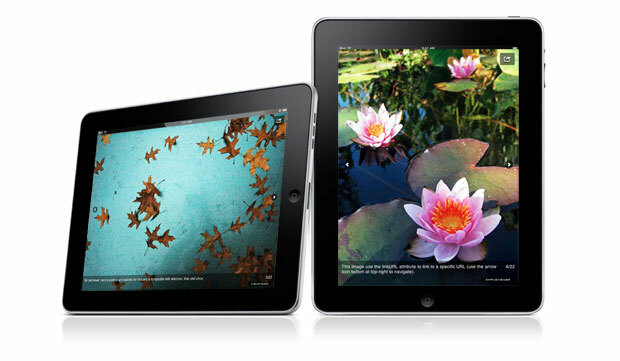 SimpleViewer Mobile provides a minimal interface to better present images on a small screen. It is automatically created and displayed on devices that do not support Flash. To see this in action, view any SimpleViewer demo using a mobile device. Thumbnails – thumbnails are presented on a separate page to the images with thumb page navigation and page indexing. Touch gestures – use finger swipe gesture to navigate between images. Overlay toggle – touch the screen to toggle the image overlay, giving less distractions from the images. This release also includes the usual bug fixes and enhancements. Check the full changelog here. As always, SimpleViewer-Pro upgrades are free within the same major version number, check here for upgrade information. SimpleViewer standard users should get the update here. Please report any issues in the support forum. SimpleViewer and SimpleViewer-Pro v2.1.1 just went live. This was mainly a bug-fix release, specifically to address issues in the mobile player. We also added a ‘useColorCorrection’ option to allow disabling Flash 10’s color correction, which can cause color shifting on some systems (details here). We made it easier to give the gallery a transparent background, either via a checkbox in svBuilder or by setting the ‘bgColor’ embed parameter to ‘transparent’. Check the full changelog here. As always, SimpleViewer-Pro upgrades are free within the same major version number, check here for upgrade information. SimpleViewer standard users should get the update here. Please report any issues in the support forum. We just released SimpleViewer and SimpleViewer-Pro v2.1, and it’s a big update! The two big new features are Universal Playback and drag-and-drop gallery creation. SimpleViewer now supports Universal Playback and can be viewed on Windows, Mac, Linux, iPhone, iPad and Android. SimpleViewer v2.1 includes SimpleViewer Mobile, a HTML5 version of SimpleViewer specifically designed for mobile devices that do not support Flash. 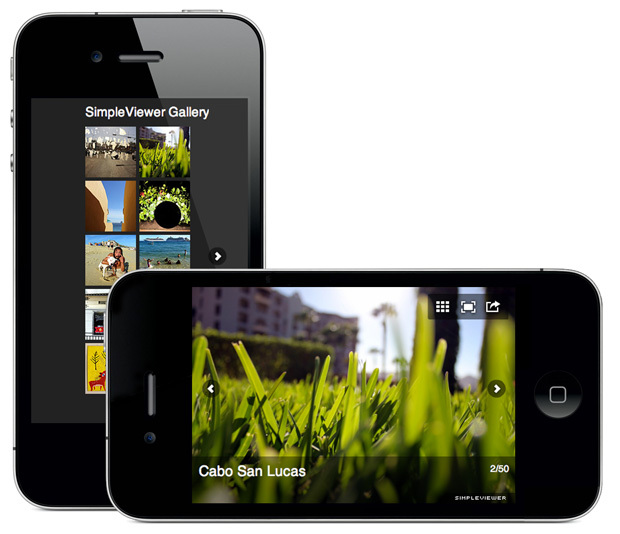 SimpleViewer Mobile provides a minimal interface to better present images on a small screen. The mobile version of the gallery is automatically created and is displayed if the user’s device does not have the Flash plugin enabled. To see this in action, view any SimpleViewer demo using a mobile device. svBuilder-Pro will automatically resize images, generate thumbnails and create the required XML and HTML embed code. As a bonus we are now releasing a free version of svBuilder for SimpleViewer standard users. View the full change log here. As always, please report any issues in the support forum. Thanks to the beta testers and the SimpleViewer support crew who have been invaluable in tracking down bugs. As always, SimpleViewer-Pro upgrades are free within the same major version number, check here for upgrade information. SimpleViewer standard users can get the update here. Want to easily create and add a SimpleViewer gallery to your WordPress blog? Try the new WP-SimpleViewer plugin. 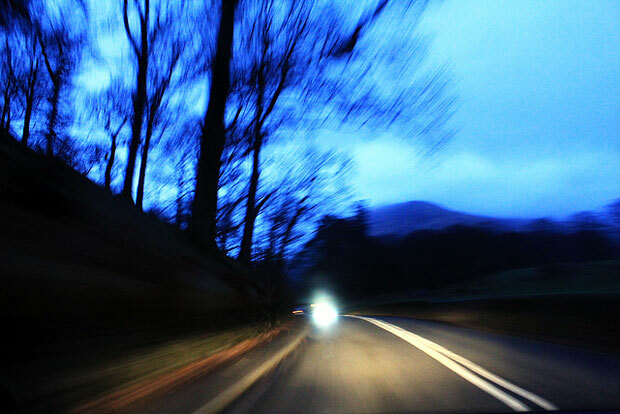 Images and captions can be loaded from the WordPress Media Library or from Flickr. Images can be uploaded directly via the WordPress media library. Change Image order via drag and drop. The new version fully supports SimpleViewer v2 galleries. A big thanks to Sudar Muthu for helping out with the plugin development. Also, thanks to Markus Fugger for building and maintaining the previous version of WP-SimpleViewer. Please report any issues or feedback in the WP-SimpleViewer forum. Here at SimpleViewer H.Q. we are working hard to ensure SimpleViewer remains the best way to present your images on the web. We’re nearing completion on 2 major new features and wanted to give a quick preview here. SimpleViewer Mobile is the much-anticipated HTML5 version of SimpleViewer, specifically designed for mobile devices that do not support Flash. This includes iPhones, iPads and Android devices. SimpleViewer Mobile provides a stripped-down interface to better present images on a small screen. The mobile version of the gallery will be automatically created (no additional steps required) and will be displayed if the user’s device does not have the Flash plugin enabled. svBuilder includes true integrated support for local galleries. To build a new gallery, just drag-and-drop images from the desktop, enter caption text and hit ‘publish’ to create all the required gallery files. svBuilder will automatically resize images, generate thumbnails and create the required XML and HTML embed code. To get your hands on the new features first and to help create a better product for all our users, you can sign up to our beta program. If you are interested in testing the new features and providing feedback, please let us know. Please indicate if you are a SimpleViewer-Pro or SimpleViewer Standard user. As always, SimpleViewer-Pro upgrades are free within the same major version number, so if you purchase SimpleViewer-Pro today, you will get access to the updates as soon as they become available. svManager has been updated to version 1.7.0. By popular demand, you can now set all SimpleViewer-Pro options directly in the svManager web interface. View upgrade details.